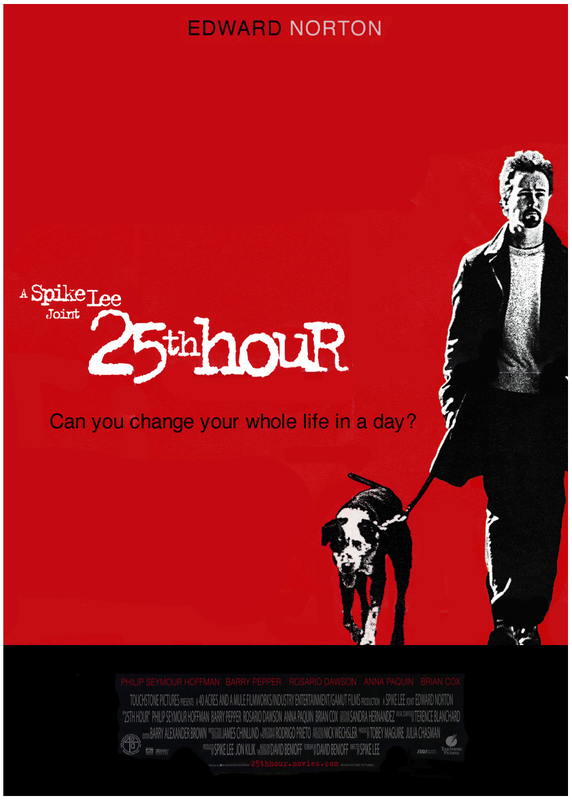 25th Hour is one of the rare occasions that I have experienced both novel and film, so at the risk of coming off as one of those ‘the novel was way better’ guys, I will be briefly comparing both. 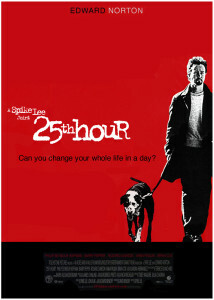 25th Hour is the story of Monty Brogan’s (Ed Norton) last day and night of freedom, before he must report to a seven year prison term for drug related offences. There are some brief flashbacks to key events sporadically through the film, but for the most we follow Monty’s movements and those of the people in his orbit, most of whom have known him for some time and therefore feel obliged to be there on his last day on the outside. These people include old friends Frank, a high stakes banker with a high net worth – but financially and in terms of self esteem – and Jacob the insecure and socially awkward school teacher – with a crush on one of his young students to boot; ‘workmate’ Kostya, Monty’s long time girlfriend Naturelle (Rosario Dawson), and his father James Brogan (Brian Cox). All know Monty’s plight. They know what he faces and have differing opinions on his culpability and more important his ‘cope-ability’, as in how he might handle seven years of hard time. Monty on the other hand has the harsh reality of being the only one with the answers, and even he has no real idea of exactly what is to come. First and foremost though Monty wants to know who will look after Murphy his pet dog, and if there’s time find out who exactly sold him out. This is not an action film, nor is it really a whodunit. Neither was the book. 25th Hour is a character study built into a simply but efficient narrative. And here is where book and film differ; where the book is allowed to unfold over 300 odd pages of brilliantly written dialogue and finely crafted sequences, the film – as most films are – clocks in at around two hours. Where the novel demanded you read all the minutiae, all the details and small but vital points that you would otherwise miss, the film medium allows these to pass by. Sure it’s easier, but it’s like looking at a fine art work from a hundred paces. Sure you’ve seen it. But have you really? At least director Spike Lee realised the quality of the screenplay and knew all he had to do was stay out of the way and let Monty examine his options – all of them bad – just as the book laid them out. I was extremely worried that Ed Norton was destined to be giving long monologues on a trolled of some sort as the action goes around behind him (and for a few seconds this does happen to one character). But for the most part Spike stands back and let’s the action and narrative tell the story, just as he did for Inside Man, and need I mention these are his two best films in a decade? The acting is first class, with Ed Norton doing Ed Norton things, and Phillip Seymour Hoffman and Brian Cox both outstanding, the mood throughout is sombre and cheerless, and the direction is surprisingly restrained. Final Rating – 7.5 / 10. The ‘guy what read a book’ in me wants to urge you to read the book (and you should, if you’re into that kind of thing), but the film ain’t bad at all either.